Luna was born at the worst day of our Whippet life, the day we had to say goodbye to her grandma, my dog of a lifetime, Supeta’s Billie Jean. It took me a long time before I was able to enjoy this very special litter. Long before this date I ordered a puppy out of Jen, super Multi Champion and Best in Show Winner, Boxing Helena’s Eva So Sweet at Bart Scheerens of Boxing Helena’s. Bart had a lot of combinations in mind but finaly decided that he would use our male, Shiny Sensation’s First Challenge (Shadow) for Jen, the son of Boxing Helena’s Epos Pente and our precious Supeta’s Billie Jean. Due to circumstances Bart was not able to breed this litter and I’m so gratefull that I got the opportunity to breed this litter at our house. The litter was of superb quality and finally Luna stayed with us, co-owned by Bart. Luna has never disappointed us. She is only two years of age and she already won a couple of Best of Breeds and even a Best in Show. 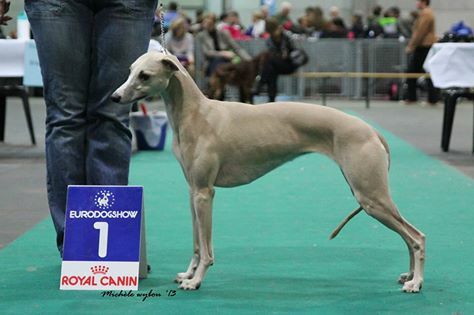 Luna loves to go to the dogshows, she is easy to handle and she has fun doing it she always does her very best!